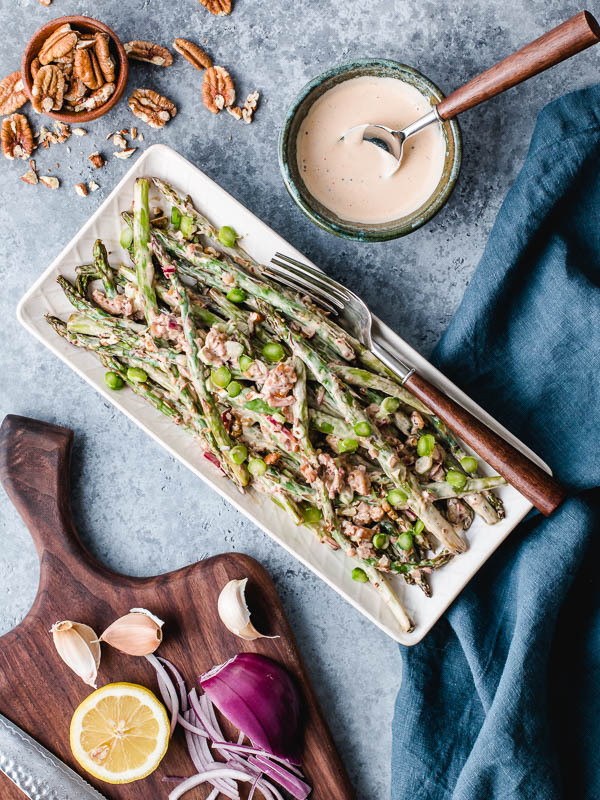 This is my best ever recipe for cooking blistered asparagus with pecans and onions tossed in a creamy and tangy mayo dressing. 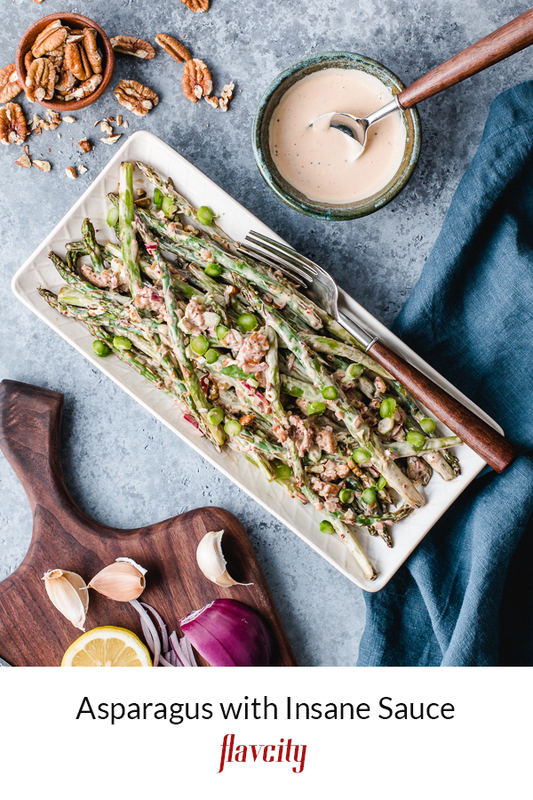 Spring is the heart of asparagus season, so I wanted to share my best ever recipe for asparagus that is blistered in a hot pan with pecans, garlic, and red onions. This is the perfect way to cook asparagus because they become slightly charred on the outside, but still have a nice bite left to them. Once the asparagus have been sauteed and have good color, they are tossed in my insane sauce. 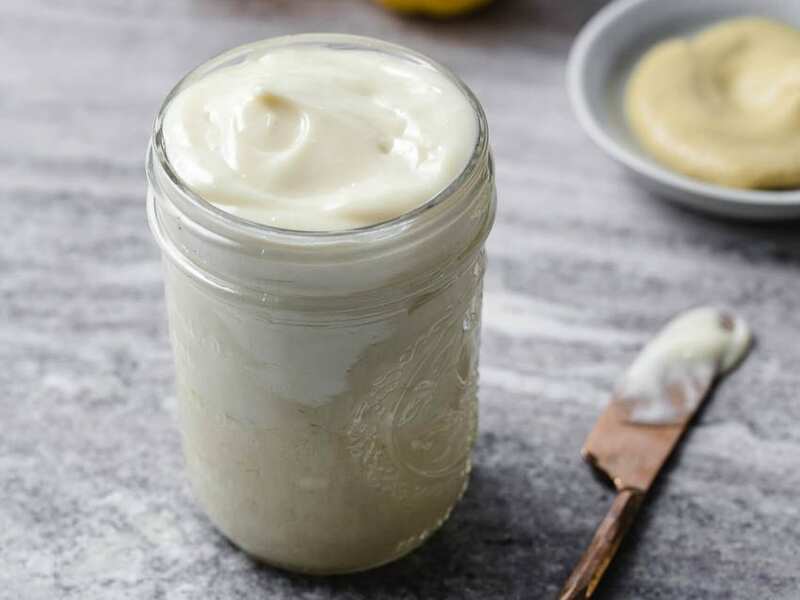 A creamy mayo dressing spiked with tamari soy sauce, stone ground mustard, and lots of umami boosting flavor. The result is an asparagus recipe that will blow you away and easily become your new favorite way to cook asparagus. I also use my insane sauce to dress my blistered green beans recipe. 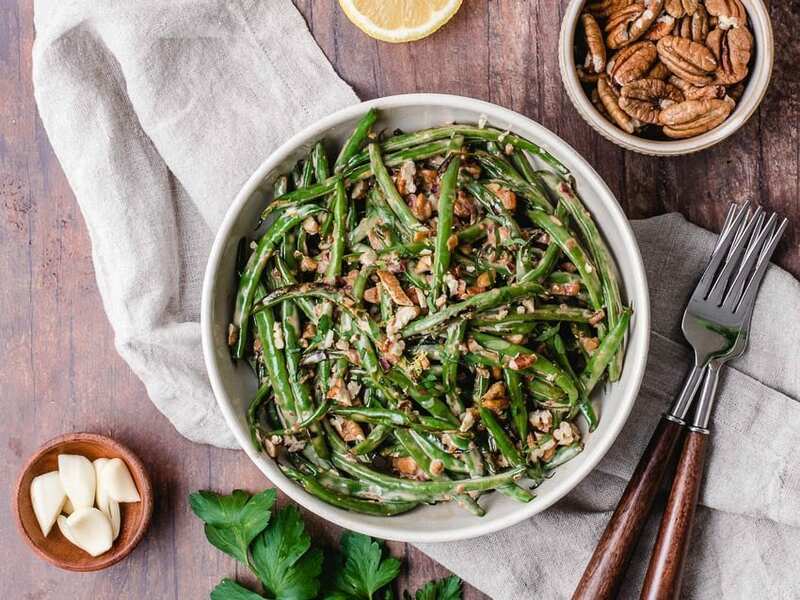 Everything is exactly the same as this recipe, so feel free to swap the green beans with fresh asparagus. How to cook asparagus in the pan. The first thing you want to do is buy thick asparagus, not the thin ones which can overcook easily. Bend the asparagus spear in half, and where it breaks is the divider between the tough part and the tender part you can eat. I use the first one as a guide, and then cut the rest about 1 inch below the break mark. I feel bad wasting that much asparagus, so just use a veggie peeler to shave away the tough skin from that inch piece at the bottom of the spear. You can save the bottom tough pieces of asparagus for soup and stock, or shave them down and finely slice them. The best way to make sauteed asparagus is in a really hot non-stick pan. This will ensure the outside of the asparagus gets blistered and slightly charred, and the inside cooks through but still have some crunch. 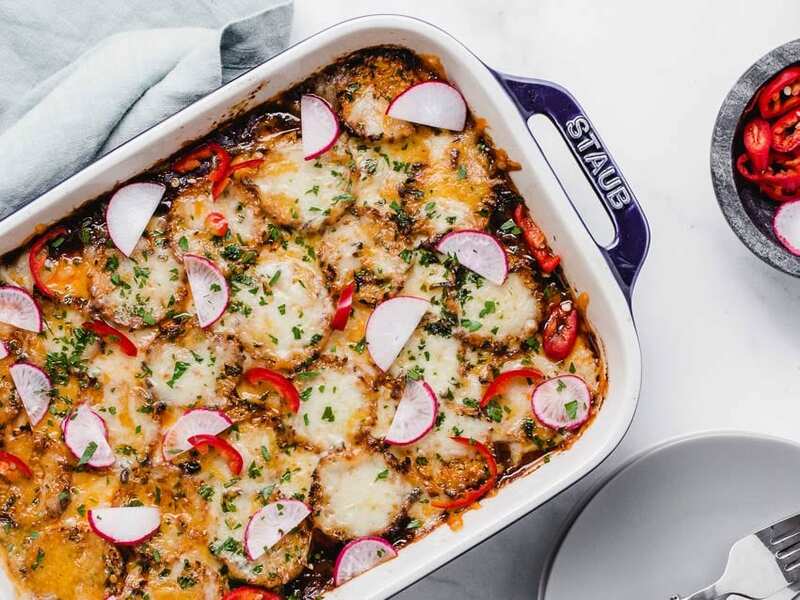 Preheat a large non-stick pan over medium-high heat with 2 teaspoons of oil for 2 minutes. Add the asparagus and cook for about 7 minutes, holding off on salting until the end of cooking. Once the asparagus have nice color on all sides, add the chopped red onions, pecans, and garlic. Cook for one minute then add a splash of tamari soy sauce, a shot of toasted sesame oil, and a pinch of salt. The tamari will add some liquid to the pan and help the asparagus cook all the way through. 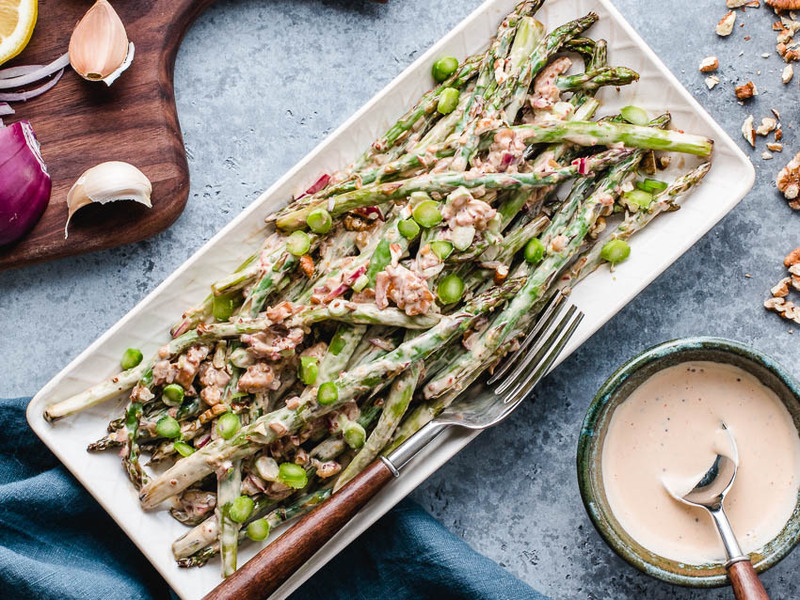 Remove the asparagus from the pan and make the insane sauce by combining the sugar free avocado oil mayonnaise with the rest of the ingredients. Allow the asparagus to cool down for one minute so the heat does not break the mayo. How Do I Cut Asparagus? The best way to cut asparagus is to break one spear in half. Grab from each end of the spear and bend it. Wherever it breaks, is the divider between the tough part and the tender part you can eat. 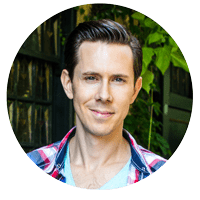 But instead of wasting that much of the bottom part, cut the rest of asparagus about 1 inch lower than the first one and use a veggie peeler to shave away the bottom part of the skin. It is very tough and hard to chew on, so you need to peel it away. You can repeat with the remaining spears and saute them. You can either use the bottom part of the cut asparagus to make veggie soup. However, what I do is peel them very well to remove the tough outer skin and then slice them into thin rounds. Go ahead and try one, the flavor is unreal! They are fresh, and grassy, and crunchy, and make the perfect garnish for this dish. Think about it, you have the contrast of textures and temperatures with the raw and cooked asparagus, it’s joy to eat. Do I Have To Peel Asparagus? You only need to peel the bottom portion of the asparagus spear, as it is very tough and fibrous. Like I mentioned above, first snap one spear in half to see where the tough part begins, chop the rest of the spears about 1 inch lower, and then peel the bottom portion of the asparagus. This is a great way to not waste too much of the asparagus, which can be pricey. 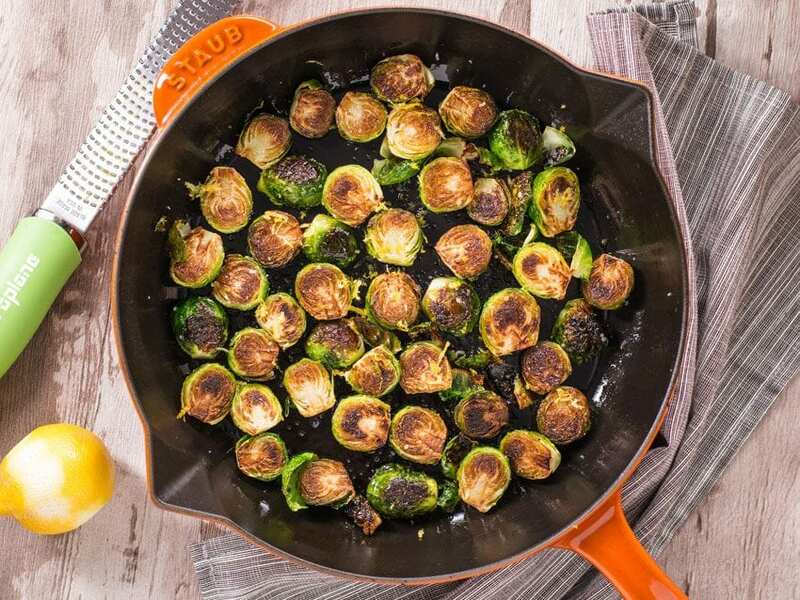 This is my favorite way to saute asparagus in a pan. The asparagus get blistered on the outside but still stay tender inside. Once cooked, they are tossed in my insane sauce. A mayo based sauce that has so much flavor, it's insane. Make the dressing for the asparagus by adding the mayo to a bowl along with the lemon juice, 1.5 teaspoons tamari, ½ teaspoon sesame oil, sambal, mustard, ¼ teaspoon salt, and a couple cracks of pepper. Mix well and check for seasoning, you may want more spice or lemon juice. Set aside. For the asparagus, pre-heat a large non-stick pan just below high heat for 2 minutes with 2 teaspoons of oil. Add the asparagus and cook for 7-8 minutes, until blistered on outside, but still crunchy. Add the onions, garlic, pecans and cook for 1 minute. Turn the heat down to medium and add 1.5 tablespoons of tamari, ½ teaspoon of sesame oil, and a ¼ teaspoon of salt to the pan and cook for 30 seconds so the beans can steam. Remove from heat and transfer to a large bowl or platter. Once the asparagus have cooled slightly add enough dressing to coat, and enjoy! Asparagus will keep in the fridge for 4-5 days, but can not be frozen.